I can only liken the Kindle entering my life to the time the iPod found it’s way into my hands. The similarities are numerous. I received both as gifts for Christmas. I became immediately obsessed with both. I turned into an ambassador for both products showing them off to friends and family with glowing recommendations. And finally, I have changed the way I think about books the same way I changed the way I consumed music after owning an iPod. Read on to find out why. Let me get the negatives out of the way first so I can gush for the last 600 words. The user interface isn’t the best, however living in the world where we are all babied by the ease of use of iOS this isn’t hard to believe. Navigating with the directional pad and options menus are tedious to begin with and this is not a product where you the manual is included in the box. I had to google many simple functions like removing books from collections and where to find your wish list when browsing the store. Turns out the secret is the “option” button which drops down different options depending on what you’re doing on the kindle. Also the lack of keyboard sometimes becomes frustrating occasionally. It’s manageable, particularly for a gamer like myself who is used to using a d-pad to type letters but any input more than a couple of characters long causes frustration and hand cramps. I’m sure the Kindle Touch solves this issue but of course it’s not available in the UK for some strange reason. Finally you should be aware that there are restrictions on the device if the Kindle isn’t available isn’t available in your country and you import it. As far as I know from anecdotes of colleagues, it does not play nice with Amazon accounts which are not from its country of origin. Now to the positives! The device’s simple design makes it a pleasure to wield. Yes, the lack of a keyboard is irritating at times but it really does wonders for the size and design of the device. Nothing distracts from what’s happening on the crisp e-ink screen. It’s small size was a worry for me at first, but after spending time with it I am now a huge fan of the fact I can stick it in my coat pocket and when I go for a coffee. 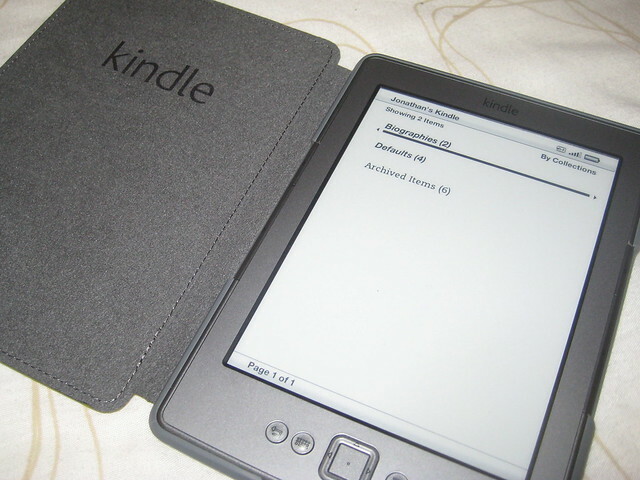 I believe that it is because the Kindle delivers its content so effortlessly that I have enjoyed using it so much. Couple this with the fact that commuting in London guarantees an hour or more of reading time every day and I find myself blazing through my reading list like wildfire. The Kindle is so light it feels almost precious in your hands, but this also means holding it while reading in bed requires none of the effort you would have reading the monstrous hardback Steve Jobs biography. Turn pages instantly with the simple press of a button along the edge of the device and I am in reading heaven. The Kindle does one thing and it does it well. Sure, I could buy an iPad and read my books on that along with a multitude of other tasks, but Amazon’s eReader does this one task so perfectly I cannot see myself ever trading my reading time over to a heavy screen over a simple, light, eInk reader. This entry was posted in Books, Geek, Technology and tagged 2011, Amazon, Amazon Kindle, Kindle, Review, UK, Wi-Fi by Jonathan Day. Bookmark the permalink. I couldn’t agree more, the Kindle is a fantastic little device. I find I read a lot more too, since it’s so easy to pick it up and read a few pages. I know what you mean about the manual, I know there’s one on the Kindle itself but I find it’s quicker just to Google the question!